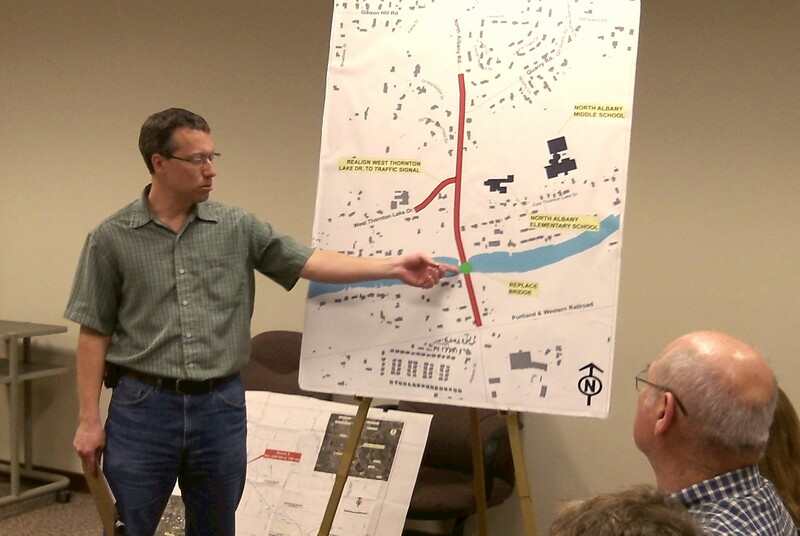 On a map of the N. Albany Road project, city engineer Chris Cerklewski points to a bridge that will have to be replaced. When they go to town in the summer of 2015, many residents of North Albany will have to take the long way round. Two big construction projects are planned on the two main roads into and out of the district, which has between 8,000 and 9,000 people. Both projects, rebuilding North Albany Road and adding a sidewalk to Gibson Hill Road, had originally been planned for this summer. City engineers told the city council on Monday both have to be postponed till 2015. North Albany Road will be rebuilt from the Portland & Western tracks to 500 feet north of Quarry Road at a cost now estimated at $4.4 million. This includes replacing the bridge across the channel between East and West Thornton Lakes. It also calls for shifting West Thornton Lake Drive to align it with the driveway of North Albany Middle School. Design and permitting issues have held up completion of the planning so the work can’t be bid in time for the 2014 construction season even though, Public Works Director Mark Shepard said, his staff worked hard to try to complete the preparations. On Gibson Hill Road, a sidewalk to help children walk safely to and from school has been in the works for several years. In 2012 the city got a federal grant of $1.18 million through the Oregon Department of Transportation. ODOT is in charge of the project, and since it would not be ready for bidding till May, when bid prices tend to be higher, Albany asked that the bidding be pushed back to Jan. 29, 2015. The Gibson Hill project calls for a sidewalk on the entire south side from the North Albany roundabout to Scenic Drive and on portions of the north side, where wetlands and utility issues made a complete walk impractical. There will be crosswalks and, for city and school buses, turnouts.